TORONTO — The NHL, the Toronto Maple Leafs and Morgan Rielly are adamant the star defenceman didn't utter a homophobic slur on the ice. What's unclear is this: Did anyone? And if so, who? The league released the findings of its investigation Tuesday in the wake of allegations swirling on social media that Rielly made an anti-gay remark during the Leafs' 6-2 home loss to the Tampa Bay Lightning the previous night. Television cameras picked up what sounded like a slur with 1:51 left in the second period as Rielly and Tampa Bay forward Yanni Gourde skated after the puck in Toronto's zone. Rielly appeared to be appealing for a penalty from referee Brad Meier about halfway through a Leafs power play, a sequence that would end with the Lightning scoring a short-handed goal. The NHL did not say in its ruling if the slur had been used, just that it wasn't uttered by the Toronto blue-liner. "League officials interviewed several of the participants in the game — including Rielly and Meier — and reviewed video of the alleged incident," Colin Campbell, the NHL's executive vice-president and director of hockey operations, said in a statement. "All of those interviewed adamantly denied that Rielly uttered a slur and the audio supported their statements." A relieved Rielly and Leafs general manager Kyle Dubas spoke with reporters at Scotiabank Arena shortly after the NHL made its announcement. "I was 100 per cent confident that I didn't use the word, so we allowed the process to play out," Rielly said in a packed media room. "It was difficult at times to not make a statement, because of how strongly I felt about it, and the fact that it is a very important issue. "But I'm very happy that it came out today, that the word wasn't used by me. I think it's an opportunity for us as a team to realize that there's really no place for slurs like that." Rielly said he didn't hear the slur used by anyone Monday. "I didn't use that word and I didn't hear it," he said. "I did listen to the video. There are different ways to listen to the video. When it's a topic that's very serious, you tend to think what may have been said." Dubas said it was unclear if the slur was uttered by anyone on the ice. "As any controversy or conspiracy theory evolves, different people hear different things," Dubas said. "The official said Morgan did not say it, Morgan said he did not say it, the audio does not pick up Morgan saying it to the official, even though I can understand why you'd jump to that conclusion, and many people did." The GM added he was stunned to learn of the allegation against his player, especially considering that Rielly had recently approached the Leafs about taking part in Toronto's Pride parade. "When it came out that it was Morgan who was alleged to have used a homophobic slur it was surprising to me, to say the least," Dubas said. 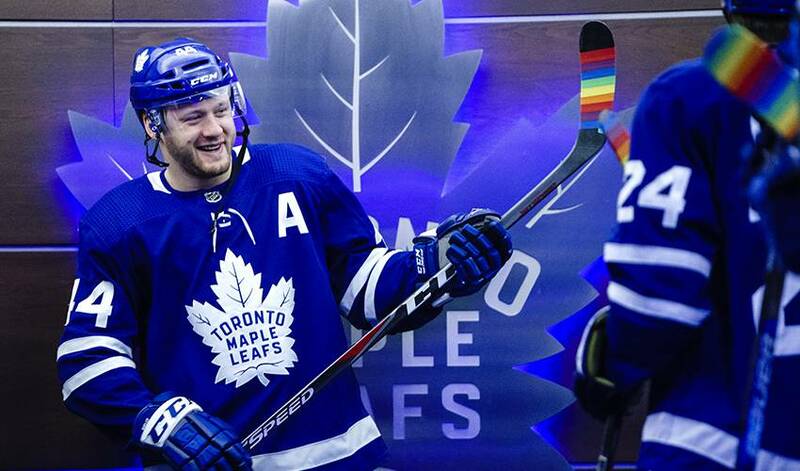 The NHL, which has been vocal in its support of the LGBTQ community in recent years, marked Hockey is For Everyone month in February, with the Leafs holding a You Can Play awareness night. But Brock McGillis, who played in both the Ontario Hockey League and semi-professionally, and became an advocate for LGBTQ rights after he came out in November 2016, said a lot of unanswered questions remain surrounding Monday's alleged incident. "For the league to say that hockey is inclusive and for everyone, they shouldn't just turn a blind eye and a deaf ear to this." Rielly sits second among NHL defencemen in scoring this season with 65 points (18 goals and 47 assists) in 69 games. The 25-year-old Vancouver native was the Leafs' first-round pick (fifth overall) in the 2012 draft. The team hosted 30 players from the Toronto Gay Hockey Association and sold You Can Play/Leafs-branded scarves with 100 per cent of the proceeds going to You Can Play on Feb. 24. The group works to ensure the safety and inclusion of all in sports — including LGBTQ athletes, coaches and fans. You Can Play tweeted a statement prior to the NHL's ruling, which the organization confirmed in an email it stands by. "Homophobic language has no place in sports," the statement read. "The words used (Monday) are unacceptable. We appreciate our partnership with the Leafs and will work with the team and the NHL to create and opportunity of everyone to learn more about the LGBTQ community, especially youth who are affected by the power of language." While the league cleared Rielly of any wrongdoing, a number of incidents involving professional athletes have arisen in recent years. Anaheim Ducks captain Ryan Getzlaf was fined US$10,000, the maximum under the NHL's collective bargaining agreement, when TV cameras recorded him appearing to shout an anti-gay slur in frustration with an official during the 2017 playoffs. Chicago forward Andrew Shaw, who is now with the Montreal Canadiens, was suspended one game and fined $5,000 for directing a homophobic slur toward an official during a Blackhawks' playoff game in 2016. And Toronto Blue Jays centre-fielder Kevin Pillar was banned two games by the club in 2017 for directing a slur toward Atlanta Braves pitcher Jason Motte. Dubas said he hopes Monday's alleged incident will help further the battle against homophobia — casual or otherwise. "I don't think the team or Morgan are victims at all, and I don't want it to be perceived that Morgan feels that way or that the team feels that Morgan was slandered," Dubas said. "Some people rushed to judgement, and that's what happens in 2019. "But there are a lot of people in our community and people that we know and people that have family members where they are affected by homophobia every single day."